Every year, hundreds of thousands of championship tennis balls are retired. In order to make a meaningful product, we had to turn our design constraints into assets. A tennis ball’s toughness and hollow interior make it a ready-made protective case. The size and construction make it an ideal skin for personal electronics. We began exploring the potential for making portable speakers. To create a powerful speaker within a tennis ball, we would need to work with teams of specialists across multiple disciplines. In order to merge the electronics with the tennis ball skin we explored different cut shapes and techniques. We collaborated with expert rubber cutters from the Woodash Group in the Boot and Shoe Quarter of Northampton, England. Together, we experimented with press cutting and 3D-printed guides. The protective skin evolved from a simple band to a slanted form that preserves 75% of the tennis ball. At the same time, we approached the Innov8 Group, a Paris-based atelier with extensive sound and electrical engineering experience. Along with the Innov8 Group, we developed electronics that complement the properties of a tennis ball. We developed a series of prototypes optimising battery life, volume and sound quality, and finally achieved the performance we wanted. The electronic control system streamlined to a single button. And our speaker grill became a Fibonacci pattern enabling optimal sound projection. 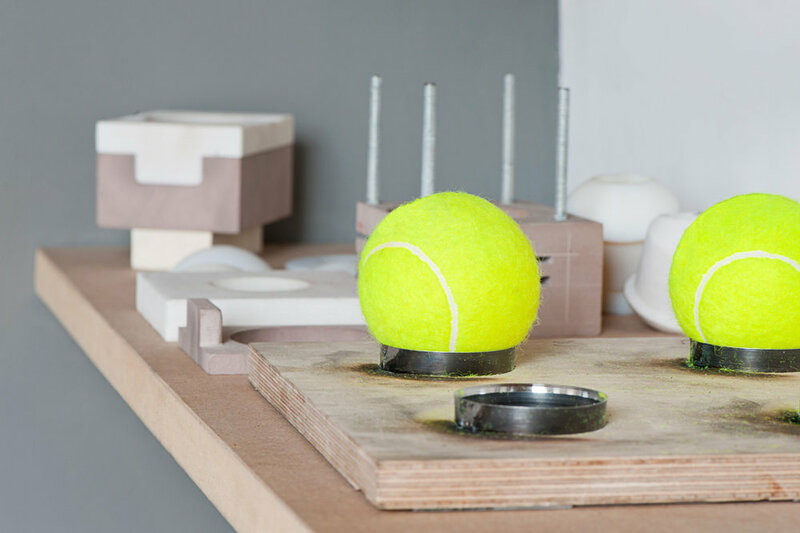 With our partners we developed an unconventional wireless speaker that brings together tennis, upcycling and product design. 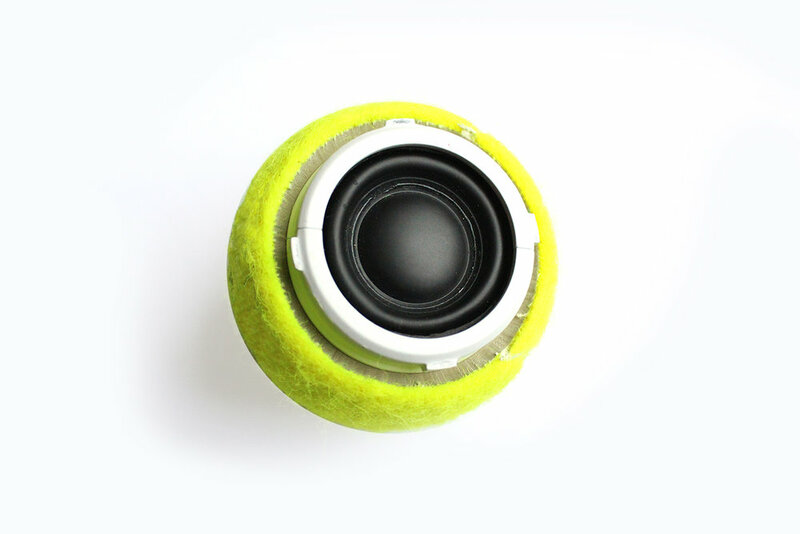 The soft tennis ball sets this speaker apart in a market dominated by metal and plastic casings, giving hearO a unique look, sound and feel. Above, the first two hearO prototypes signed by Roger Federer (right) and Novak Djokovic (left) at the 2015 ATP Finals in London. We concluded our Kickstarter in the 2016 summer. Our successful campaign enabled hearO’s first production run and allowed us to share our product and story with the world. We hope that hearO’s guiding ethos, story and design resonate with you. 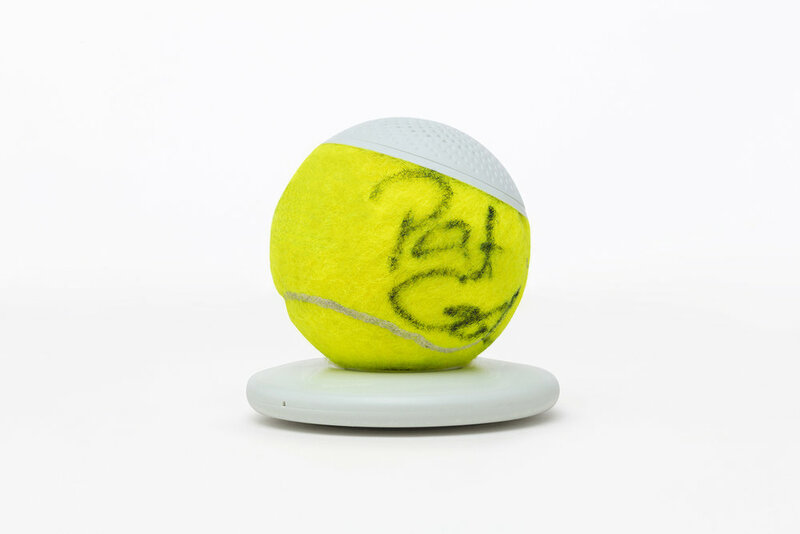 For our Kickstarter, 1987 Wimbledon Champion and musician, Pat Cash signed some tennis balls for a reward tier. Our Wimbledon balls were all weathered slightly differently which added to the character and bespoke nature of each hearO speaker. We also experimented with natural and organic fabric dyes.